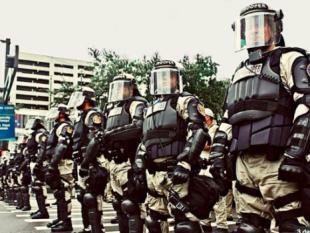 The concept of “militarization of law enforcement” has been a hot topic for debate over the past few years. There are many examples of law enforcement units wearing military style uniforms and using military style equipment to conduct operations like narcotics searches, conferring arrest warrants or responding to violent crimes like bank robberies and homicides. The sight of police officers wearing full tactical gear can seem over the top for the average citizen; but members of the law enforcement community argue that this equipment is necessary to protect officers during the execution of high risk operations. In “Overkill: The Rise of Paramilitary Police Raids in America,” Radley Balko argues that over the last 25 years America has seen a disturbing militarization of its civilian law enforcement, along with a dramatic and unsettling rise in the use of paramilitary police units (most commonly called Special Weapons and Tactics or SWAT) for routine police work. There have been myriad news stories outlining law enforcement agencies nationwide that have called in these SWAT teams to conduct routine operations, some highlighting successful operations along with operations gone terribly wrong. One such example happened in Detroit. A SWAT officer killed 7-year-old Aiyana Jones while searching for a murder suspect. Another incident involved Atlanta Police serving a narcotics search warrant at the home of 92-year-old Kathyrn Johnston based on information from an informant. Johnston fired upon police during entry and was killed. The police did not find drugs in the house and officers were subsequently charged for planting drugs from a previous raid in Johnston’s house. These two examples can be used to argue against law enforcement agencies using military style tactics and equipment when conducting routine operations. Balko further asserts that such raids are increasing and are needlessly subjecting nonviolent drug offenders, bystanders and wrongly targeted civilians to the terror of having their homes invaded, usually by teams of heavily armed paramilitary units dressed not as police officers but as soldiers. The majority of these raids are conducted over misdemeanor crimes such as minor drug possession. This raises serious concerns about how law enforcement agencies conduct operations based on the severity of the alleged crimes. There are multiple viewpoints on the concept of militarizing our law enforcement. The law enforcement community offers the argument of keeping their officers safe at all costs, which is a valid concern. Officers do not sign up to be injured or killed while serving their communities nor should they be expected to suffer injuries while on duty. However, they do acknowledge the inherent risk involved with serving as a law enforcement officer especially during high risk situations. Civilians, and communities at large, will argue that their rights are being violated due to the amount of force being used whether it is physical force or the show of force when officers appear with military style uniforms and equipment. These are valid concerns that must be addressed if the nation is to ease the tensions between communities and law enforcement agencies. Does race add to the law enforcement agencies thought processes when using military style equipment and tactics? Do law enforcement agencies have serious training issues that need to be addressed concerning their tactics and equipment? Do law enforcement agencies and local communities need to do a better job of working together to improve relations? Do law enforcement agencies need to reconsider policies governing their tactics and their use of certain equipment? Finally, does the federal government need to intervene with the militarization of law enforcement? Author: Jeffrey R Zimmerman, a doctoral student in public policy and administration at Walden University, completed his dissertation titled, “The Impact of Supervisor-Subordinate Exchange on State Government Employees.” He currently serves as the director of processing services within the North Carolina Division of Motor Vehicles. Jeffery can be reached at [email protected] or [email protected].